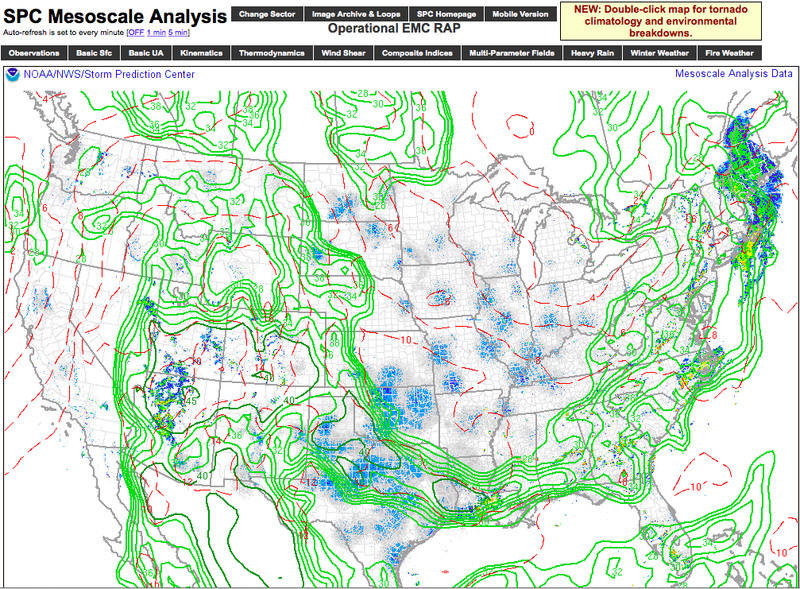 The SPC Mesoanalysis pages can be configured to provide a huge amount of weather data. I start with the national sector, but regional sectors of the same data can be obtained here. Radar, county warning areas, cities and highways and the like can be overlaid by selecting on the right side of the page. The top menu bar provides all of the weather options. Under the "Thermodynamics" menu header, I look at 3 sets of data. First I pull up the surface based CAPE plot. This shows the convective available potential energy at the surface, which is one of the raw ingredients for thunderstorm initiation. Second, I look at the surface based lifted index, which shows the basic instability of the atmosphere above the sounding location, with the more negative numbers indicating greater instability. Lastly, I review the K-Index plot. The K-Index is a computed indication of thunderstorm potential, based on lapse rate, amount of moisture and moisture depth.